In 1986, Maurice Blanchot's The Writing of the Disaster was published in an English translation by Ann Smock. It was hailed by many as a significant philosophical work, and has since garnered a reputation in contemporary critical theory for its engagement with issues of trauma, representation and the task of writing. Blanchot's text has sparked the interest of literary scholars, philosophers and historians for its examination of language, testimony and twentieth-century history. The Writing of the Disaster is not a work belonging to any specific academic discipline. It is neither a philosophical text as such, nor a work of literature, but instead chooses to occupy a kind of in-between state. It is a book composed with fragments and momentary observations, refusing the pretended coherence of a rational account or a well-structured argument. Whereas language breeds an expectation of presence and transparency, Blanchot's work seeks to interrogate and undermine this assumption. The Writing of the Disaster questions the legitimacy of all traditional ideas of representation, whether they originate in the witness, the philosopher, or the historian. And so, to question Western assumptions, for Blanchot, means to question the postures and assumptions of its practices. Desecrated and partially destroyed, this Torah scroll was once the treasured possession of a Jewish family in Pultusk, Poland. The Pole who offered it for sale after the war claimed that it had been used as the backdrop for executions of Jews in a courtyard in Pultusk. Jews Jerome Lipowicz and Abraham Zielinski purchased the scroll and eventually brought it to the United States. Now in five fragments, it is a stark reminder of the sacrilege inflicted upon the Jewish religious community. And so, we can imagine why the scrolls offer a convenient visual signifier for Blanchot's The Writing of the Disaster. 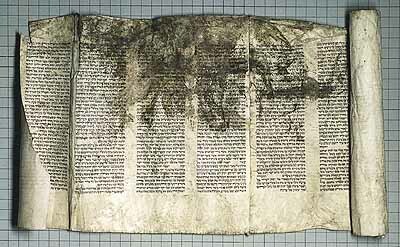 First and foremost, the scrolls present a written text partially destroyed by historical circumstances; a linguistic text disrupted and partially silenced by history. Secondly, it is implied that damage to the sacred religious text was the result of Nazi involvement, which neatly symbolizes a subjugation of language to the interests of dominant political ideology - a key concern in much contemporary theory. And finally, the text itself is incomplete: there are now only five fragments in existence, which is not only a 'stark reminder' of historical persecution, but a reminder of the incompleteness of any account, or any understanding. Another reason why, superficially at least, the photograph has a strong political and historical resonance with the central ideas of Blanchot's fragmented book, offering The Writing of the Disaster the strong import of contemporary relevance. 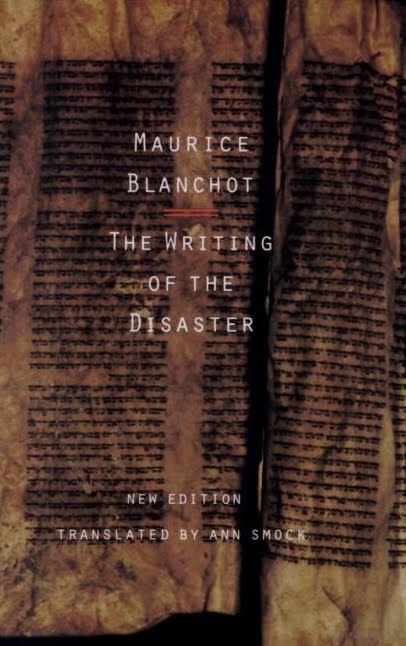 But there is also a strange discrepancy between Maurice Blanchot's The Writing of the Disaster and the photograph on its front cover. There is, of course, a certain kinship between the points Blanchot raises and the motive behind Arnold Kramer's photograph: they both provide us with the essential impression that historical accounts are always already in jeopardy. But there is a fundamental difference between the partially destroyed Torah scrolls and Arnold Kramer's photographic representation. While the historical artifacts themselves are sacred relics, prone to fade and diminish with time, Arnold Kramer's photograph implicitly reinforces the old-fashioned ideal of representation that Blanchot rejects. In the museum, the photograph becomes an agent of preservation: a tangible manifestation of memory and history that makes present that which has passed. The Writing of the Disaster repeatedly challenges the notion that we can fully represent history, or catastrophe, as comprehensible and complete. For Blanchot, historical testimony is by its very nature flawed, troubled and incomplete. That is not to say it is false, or that it is not important to us. But rather, that we cannot assume to understand the full scale of the disaster, the catastrophe, or the traumatic reality of historical events. We can never make present the full horror of a given event with use of a witness, or a text, or a photograph: it is always obscene (off-stage) and beyond our grasp. Blanchot makes a neat problem of this convention, prompting us to take a step back and examine everything with the utmost caution. It is problematic to assume that the Torah scrolls are emblematic of disaster, or the horrors of the Holocaust. For in essence, these emblems can assume an authority of their own, which tends toward overwriting and even extinguishing the historical reality. And so, it is important to remember, in order not to forget; but more important still, to remember that the act of remembering can itself be a form of forgetting.